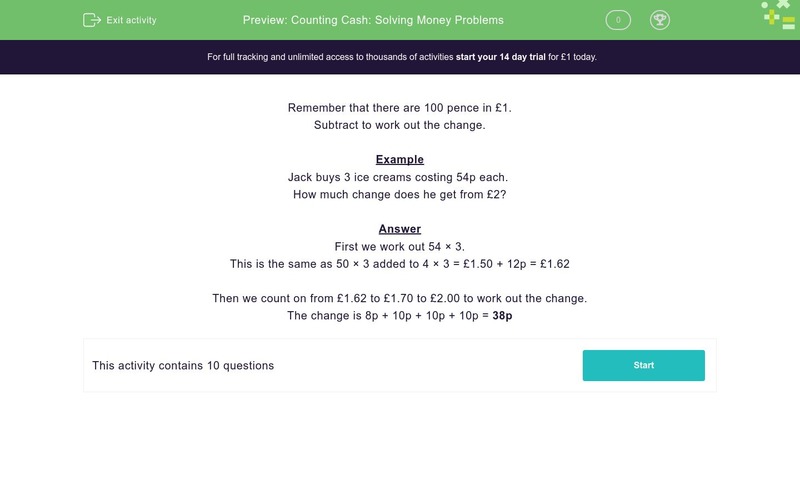 In this worksheet, students answer word problems relating to money. Remember that there are 100 pence in £1. You subtract if you want to work out the change. Jack buys 3 ice creams costing 54p each. How much change does he get from £2? First we work out 54 × 3. Then we count on from £1.62 to £1.70 to £2.00 to work out the change. Jack buys 3 ice creams costing 52p each. How much does this cost him in pounds? How much change does he get in pence from £2? Jill buys a book costing £6.51. How much would two of these books cost in pounds? How much change does she get in pounds from a £10 note? Bella was given four £5 notes for her birthday. She bought a t-shirt for £5.50 and a book for £2. How much did she have left in pounds? Fatima is saving up for a bicycle which costs £45. She already has five £5 notes. How much more must she save in pounds? A can of lemonade costs 45p. A pack of 4 cans cost £1.50. How much do I save in pence by buying a pack instead of 4 individual cans? How much will nine marbles cost in pence? Akeel bought a pen for £14.50, some paper for £4.60 and some envelopes for £3.50. How much did he spend altogether in pounds? Each of Amir's four children get £4.30 pocket money every week. How much does this cost Amir in pounds every week? We don't need to write £20.00, as £20 means the same thing.